Lilies are truly show stopping flowers, meaning that a bouquet of lilies from Peterhead Flowers is a great choice if you’re looking to purchase a gorgeous bouquet. The class and grace which lilies bring ensure that a lily bouquet is a purchase you certainly won’t regret. The florists in Peterhead are delighted that we can offer our customers such a large range of lily bouquets and flower arrangements, as we are sure that there is something for all tastes in our collection. The florists in Peterhead have a great deal of skill and expertise, so your flower bouquet is guaranteed to be of the highest quality. Should you need any advice concerning your stunning lily bouquet, feel free to contact our friendly florists who would be happy to help you with anything you need. At Flowers Peterhead we value clear communication with our customers, as it ensures that everything we can do everything possible to make sure that you are satisfied. Peterhead flower delivery service is able to provide a reliable flower delivery service in Peterhead and the surrounding area of the North East of Scotland. However, should you wish for your lily bouquet to be delivered further afield, Peterhead Flowers is also able to cater to your needs. As part of the Interflora brand flowers ordered with us in Peterhead are able to be delivered all over the United Kingdom, which is perfect if you would like to send your lily bouquet as a gift. Should you wish for your lily bouquet to be delivered abroad, ordering in Peterhead is a simple way to do this as we are linked with international flower delivery services, delivering flowers in 140 different countries across the world. Our dedicated team will carefully oversee your lily bouquet order until it has been safely delivered, so you can rest assured that your lily bouquet order is in safe hands. 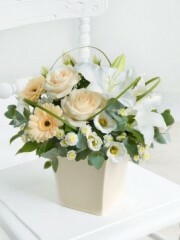 Choose Peterhead Flowers for a wonderful lily bouquet delivered carefully to you. 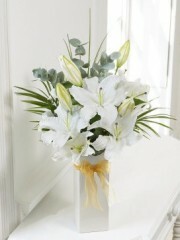 Lilies are a fantastic choice if you’re looking for any eye catching bouquet from Peterhead Flowers. The varied range we have on offer for you is something that the florists in Peterhead pride themselves on. 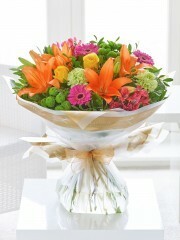 We are sure that the range of style and colour for our lily bouquets means that there is something to please everyone. Amongst our collection we are able to offer bouquets composed of only lilies, and other arrangements including stunning lilies and other flowers, all skilfully crafted by our expert florists in Peterhead. For those looking for a pure lily bouquet we can offer four options: the scented lily vase and the luxury Oriental lily vase in either white or pink. 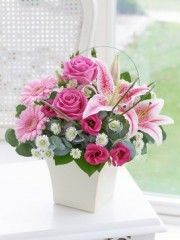 The white makes a delicate yet beautiful choice, whereas the pink lilies are more vibrant and bold. Our other flower arrangements including lilies are also simply exquisite, so you can trust Peterhead Flowers to provide you with the highest quality lilies. The Vera Wang scented delight bouquet is a fantastic combination of roses and lilies, resulting in a hugely romantic flower arrangement from the Peterhead florists. You can count on Peterhead flower delivery service to deliver you a gorgeous lily bouquet, as we can offer a same day delivery service on all products ordered before 3pm, meaning that your fresh lily bouquet will be delivered to you as soon as possible. Choosing Flowers Peterhead to provide you with a splendid lily bouquet is a fantastic decision.